The Hormel Vital Cuisine brand is in its infancy, but it represents a direct effort by a protein-processing giant to impact a cancer-patient community desperate for food that meets hyper-specific nutritional and quality needs. Few people today don’t know someone that has developed some form of cancer in their lifetime. Indeed, the greatest battle the human race has ever fought continues — though with some signs of hope over the past few decades. According to “Cancer Facts & Figures 2016” (published by The American Cancer Society), the five-year relative cancer survival rate for all races and genders was 49 percent in the mid-1970s (1975-1977) — in 2005-2011, that number had improved significantly to 69 percent. With more people winning the battle against cancer on an individual basis, research has grown to help patients recover. Fighting cancer has become serious business not only for academia and pharmaceutical companies, but also food companies, which have chipped in funding and expertise to help patients battling to get their lives back. 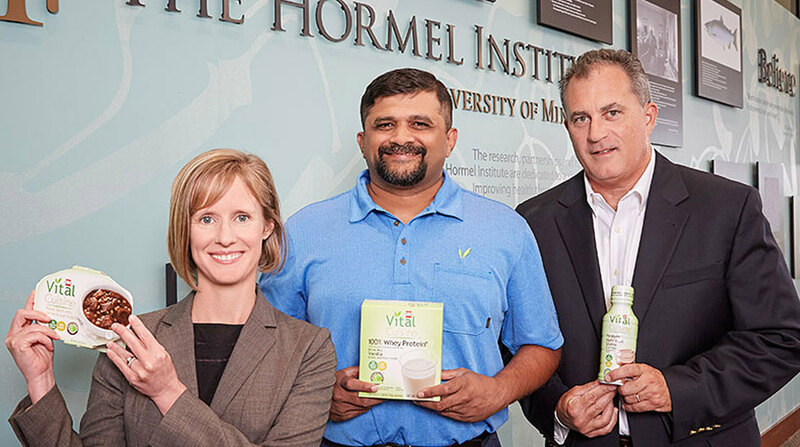 Among those food companies is Austin, Minn., processor Hormel Foods — which has a history of funding cancer research and this year launched its most direct volley in assisting cancer patients: the Hormel Vital Cuisine line of products. Justin Gold Visits Hormel Foods World Headquarters Justin Gold made a trip to Hormel Foods World Headquarters to share his business journey.